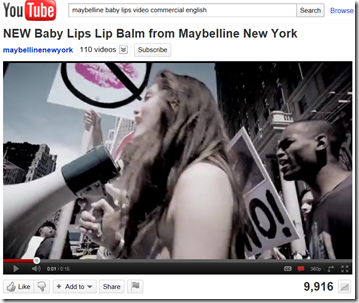 At least by Maybelline in their commercial for Baby Lips. I don’t generally watch commercials. I have a DVR in the form of Windows Media Center. However sometimes I’m held captive, for instance when I go to see a film at a theater. I guess I could leave my ear buds in a little longer… I saw this commercial from Maybelline last time I went to a movie and again last night. I’m appalled, It just blows my mind, am I wrong? 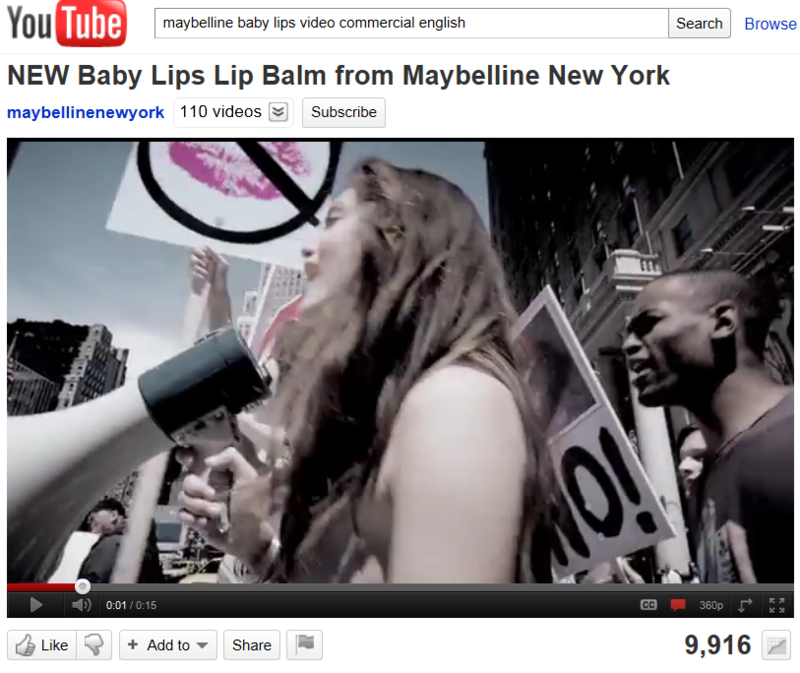 Is this commercial for Maybelline Baby Lips, a huge corporation owned by L’Oréal, not using images of revolution?, a revolution that objects to the ravages of corporations on the worlds citizenry? 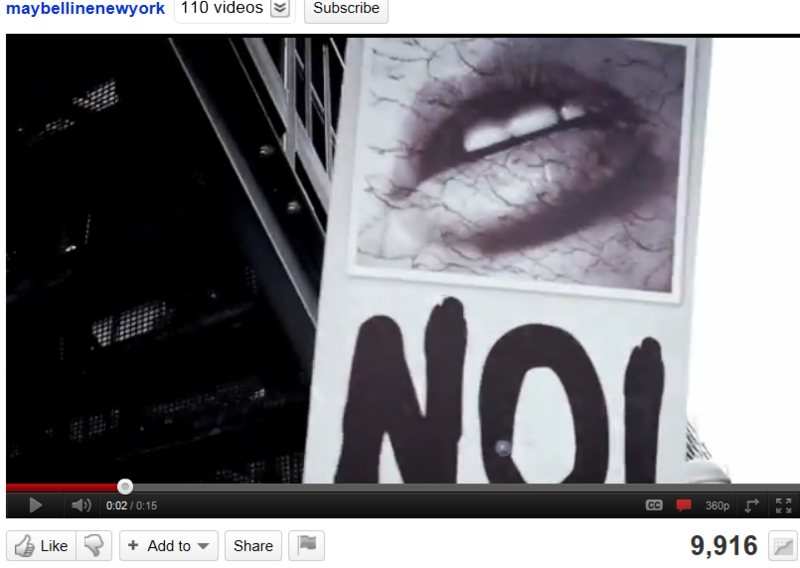 with a New York background, where the Occupy movement began, to sell moist glossy lip balm? I duno, it just seems wrong. But perhaps I’ve tipped over that point where, like Howard Beale’s audience, "We’re as mad as hell, and we’re not going to take this anymore. "1 and that my frustrations with politics, the economy, global warming, agribusiness2, education and the inequality in the distribution of assets be they financial, life, liberty, or perhaps just a pursuit of happiness for everyone has me so frustrated it’s hard not to see conspiracy everywhere. For me I think that’s what the Occupy movement is all about. Living is for everyone. There are a very few that seem to have an insatiable appetite for power and control beyond the consensus of the inhabitants of and the consequence of their actions to this, our biosphere, earth. Check out these two screen captures and a short video of the commercial, I couldn’t find the longer running version I saw that contains more of the revolution images. 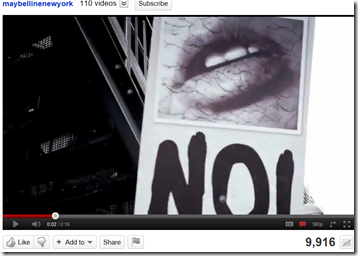 However I did find a behind the scenes making of the commercial that has the images. They aren’t on screen all that long, perhaps it’s a bit of subliminal suggestion? Maybe not… “It’s the end of basic lip balm” the voice over in the commercial begins and a cut away to these revolutions shots. Now certainly politicians are exploiting, or attempting to exploit, the movement. I wonder if there are other examples of corporations doing so? Feel free to leave an example in the comments if you’ve seen other examples. The iconic phrase historically spoken by Gil Scott-Heron and recently by Gorillaz and Snoop Dog. I don’t know if the revolution will be televised. 2) Check out the Small Planet Institute for information about agribusiness.